A student-oriented Veterans Day service will be led by the Rev. Stephanie McLemore, college chaplain and director of church relations, in Snidow Chapel at 10 a.m.
At 10:45 a.m., a lunch for the LC community will be hosted by President Kenneth Garren and his wife Sheila Garren in the West Room, third floor, Drysdale Student Center. The guest speaker is LC alumnus Louis Alvey, a mental health clinician for Horizon Behavioral Health and a member of the Virginia Army National Guard, 1/116 Infantry Battalion. Faculty, staff and student veterans are invited to the luncheon as guests of the College and may bring a guest. Lunch for other visitors is $15. At 12:30 p.m., the college will dedicate the John D. Bower ’57 Veterans Lounge and Advocacy Center with remarks by Dr. Bower (pictured above right) on the third floor, Drysdale Student Center. 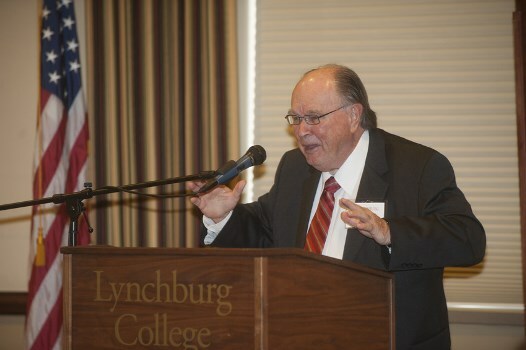 A native of Bedford, Va., Dr. Bower established a veterans scholarship fund, which provides annual scholarships to eligible veteran students with a 3.0 GPA or higher, with first preference to those pursing degrees in science at LC. He has also issued challenge grants to establish the Bower Veterans Lounge and Advocacy Center to provide resources, computers, special program events, and an environment that aids veterans as they transition from military to academic life and then to professional and civilian life. Dr. Bower, a retired physician renowned for his pioneering work with kidney disease and dialysis, served for four years in the U.S. Navy on a destroyer.